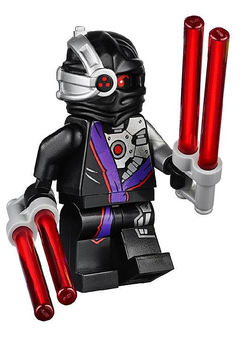 The Nindroid Warrior is Ninjago minifigure introduced in 2014. The warrior serves as a minor antagonist in the third season of Ninjago: Masters of Spinjitzu, and is a playable character in LEGO Ninjago: Nindroids. The Nindroid Warrior has black legs, hips, torso, hands, head, and a right arm, with a a grey left arm. The torso, hips, and legs feature printing depicting a black kimono with purple accents, and the torso is also printed to show mechanical details underneath the Nindroid's kimono. The Nindroid also wears a black hood with a mechanical grey eyepiece covering its right eye. Pythor then turned his attention to the one remaining source of golden power; the Golden Weapons currently in space. Returning to the Serpentine city of Ouroboros, the Nindroid Warriors began construction on a rocket with the codename of "Arcturus". This is a description taken from LEGO.com. Please do not modify it. Nindroids are high-tech fighting machines manufactured based upon the blueprints of Zane. But they are the next generation of artificial warriors, stronger, faster, and more agile than Zane has ever been. In addition, they have cloaking abilities that let them turn invisible. This mechanical army serves the Digital Overlord. Where Zane is able to feel friendship and more, Nindroids have no emotions. They are completely cold and totally focused on accomplishing their mission. Nindroids cannot be reasoned with or frightened off and they will only do strategic retreats if it seems that defeat is inevitable. "Art of the Silent Fist"
Nindroids are high-tech fighting machines manufactured based upon the blueprints of Zane. Where Zane is able to feel friendship and more, Nindroids have no emotions. They are completely cold and totally focused on accomplishing their mission. Nindroids cannot be reasoned with or frightened off and they will only do strategic retreats if it seems that defeat is inevitable. This page was last edited on 14 July 2016, at 11:44.